But v good friend Michele has been actively weblogging the 2013 Fantasy Faire this year, and I’ve now been there all of twice, and apparently it’s still going on at least for today (they are having a live auction of various parts of the Faire sims and builds, which seems really cool) and maybe for longer although I’m not sure, and I took a couple of pictures that I like, so here I am weblogging about it myself! 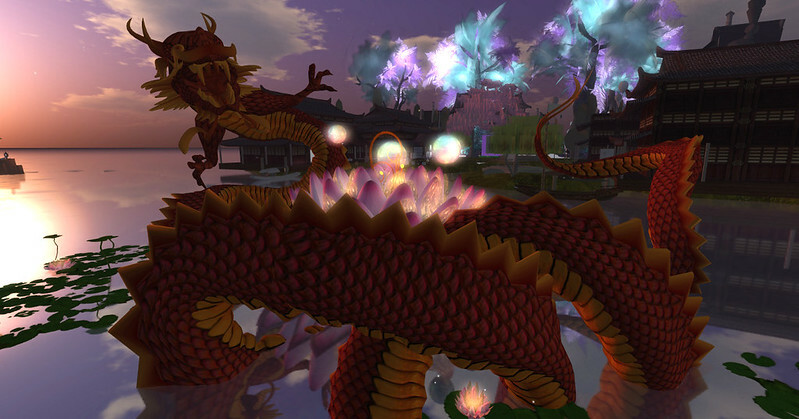 There is the left half (depending on exactly how you’re viewing this) of a picture of me standing looking out at the dragon in the Lotus Valley Dream harbor; click through to see the whole thing, bigger sizes, usw. That’s just two shots from one gorgeous sim in a big collection of gorgeous sims in varying and wonderful styles. While I understand and sympathize with the tendency to use SL to make ourselves into our sort of RL ideals (90210-style, if you will), this is the kind of SL thing that really delights me: going beyond the RL-possible, into fantasy, and dream, and creativity, into worlds and realities beyond the ones that we happen to be born into. And the fact that it’s for a great cause, Relay For Life, just adds to that. Also dragons are cool. :) Not to mention, shopping! Here’s the group pool for the flickr group for the Faire, where you can see lots more. And assuming I post this in time, you can maybe still go yourself! Is Frogger More of a Virtual World Than Second Life? This morning in the tub when I was trying to think of some more headlines that would make Second Life sound bad without being too obvious about it, I decided it was again time to make some subtly negative comparison of SL to something else. And the perfect example was right there on the bathroom wall, on my poster of old arcade games: I would make a post saying that Frogger is more of a virtual world than Second Life! Now this might seem weird at first glance, since people don’t usually consider arcade games to be virtual worlds, but the thing is, there’s no one agreed upon definition of “virtual world”, so really I can write anything that pops into my head, and no one can say that I’m wrong. So nyah-nyah in advance to all you negative commentors! Frogger is geographically contiguous – Second Life is not. Long ago, it was possible to walk from one end of Second Life to another. Now, SL is dominated by thousands of private islands, many of which are artificially inaccessible. By contrast, you can hop from one end of Frogger to the other, if you don’t get run over, just like it’s possible to walk from New York to Australia in the real world. 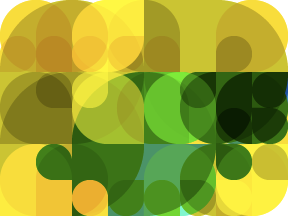 Frogger has an internally consistent, universal physics — Second Life does not. In some areas of SL you can fly; in others, you cannot. You can even change the position of the sun, and soon, the very way light is filtered. And so on. Frogger has a pre-existing ecosystem of flora and fauna — Second Life does not. Alligators and speeding trucks thrive in Frogger. Outside of virtual pets and the rare virtual ecosystem, SL is mainly bereft of animal species, and has none that exist independent of their human creators and owners. Frogger is self-contained and relatively separate from the the wider Internet — Second Life is much more integrated with the web, and therefore, arguably less “worldly”. Frogger doesn’t have much dynamic user-generated content — but Second Life doesn’t have “natural” dynamic user-generated content either. In Second Life, user-created objects artificially instantiate out of thin air; also, Minecraft is better than Second Life, too. Frogger is a single unified experience of a world — Second Life contains multitudes of very different world-like experiences. A “world” that contains, for example, space marine shooters, fantasy MMOs, urban roleplay, furries, Goreans, real life educators, metaverse artists, and so on and on, seems less like a world, than a platform for multiple worlds. The real world, after all, contains only one kind of thing, not many different ones! Frogger has not stubbornly continued to be successful despite my constant sniping — Second Life has. Not that I’m bitter or anything. But someday SL will finally fail, and then people will stop snickering at me behind my back, pointing and giggling about Blue Mars! Someday they’ll all pay!!11!1! Of course, none of this suggests Frogger is superior to SL, oh no not at all, didn’t mean to suggest anything like that, any more than I did in my “Why call it Second Life when it has a low retention rate?” story, or my “Coffee and Power can succeed unlike SL which is a pathetic failure” story, or my “Second Life has failed due to poor execution and market timing” story, or my “Second Life is doomed because I am not in charge of it” story (parts 1-27). But I will say this: If you’re interested in widening the market for virtual worlds (and I am), it’s a good idea to widen the definition of the category, preferably enough so that it includes some CEO that will reliably return my calls. I was recently talking to one of my very good CEO friends with whom I regularly hang out at exclusive meetups and other trendy events, and while I don’t know if he agrees with me about everything, I do know that many present and former Lindens, US Presidents, and the prophets of all major religions, including Philip Linden, probably do, because after all I am right, and Second Life is doomed unless it changes completely. Transforms itself into a chicken farm. And I don’t mean some stupid virtual chicken farm, I mean a real-life chicken farm, with chickens and stuff. Have you seen the profit margins those places make? It’s insane! The chicken franchise is, after all, orders of magnitude larger than the Second Life franchise, or even the Sims franchise. Everyone eats chicken! mmmmm, chicken! Of course Second Life’s current stuffy narrow-minded piggish repulsive decaying stupid users, who don’t listen to me and even satirize me in their weblogs even though they have probably never even talked to Rodvik, will moan and whine and kick their little feet about this, because they hate and fear change. And chickens. They are chicken-haters! The inevitable changes to the UI that will allow you to click and move your little person to the window where they can buy Linden Lab stock, the only necessary operation once the company is transformed into a profitable chicken farm, will be met with stuffy narrow-minded piggish repulsive decaying stupid whining, but I will counsel my good friend Rodvik (who I call “Rod”, or even “Roddy-baby”) to ignore them, since one’s current users are always less important than the millions of users that one might have in the future if a miracle occurs. And you should by no means read or pay any attention to people who advise listening to current users, because they are wrong. In 2010, there were 79 new posts, growing the total archive of this blog to 260 posts. There were 33 pictures uploaded, taking up a total of 1mb. That’s about 3 pictures per month. The busiest day of the year was January 18th with 205 views. The most popular post that day was Dept. of OMGWTF. The top referring sites in 2010 were twitter.com, davidchess.com, adric.us, slofdreams.blogspot.com, and wiki.secondlife.com. Some visitors came searching, mostly for roger dean, dale innis, bank of ganja, ganja, and evony play discreetly. We note with deep regret the passing of a good friend. Adric was a complicated person, a funny person, a person who often wore a clownish or grumpy or vulgar mask; but under the masks and the grumbling was someone good-hearted, warm, and I think more sensitive and caring than he could always bring himself to admit. His weblog is a testament to humor and complexity and grumpiness, a wild place of talking cats and armed insurrection and sardonic humor. When he left us, he was working with Amalia on a Burning Life build that had a bouncy-castle, crayons, and a hopscotch court. Which I’m sure he would have taunted himself about extensively in the weblog. Adric could always make me smile. I will miss him. There’s been this meme going around the weblogs lately, on the notion that Second Life should (or shouldn’t, or could, or couldn’t) be, or contain, or support, or be structured as, a democracy. I think this is a fun idea :) and will play with it here a little. This isn’t intended as a direct response to, or agreement or disagreement with, anything that anyone else has written. Well, except where it is. Some folks have said that it’s really impossible, because you couldn’t have direct democracy because you couldn’t get all the Residents in one place to vote or whatever, and you couldn’t have representative democracy because who would decide which groups would get represented (furries? Goreans? dragons? ), and anyway however you did it people would just cheat by creating additional accounts and additional Residents to get extra votes. I think alot of that would really be not all that hard to get around. You could have direct democracy by just putting voting into the client or a web-page or whatever; no need to get all the Residents in one place inworld. Whatever question was up for vote could be voted on from wherever you happened to be when you felt like voting, and voting could be left open for a week or whatever. You could have representative democracy, too, without having to establish an official set of interest groups, by doing it just like in the Atomic World. Representatives don’t represent Bowlers, or Married People, or Camera Buffs; they represent everyone who lives in a certain area. The idea being, presumably, that people who live near each other tend, as a general rule with countless exceptions, to have similar interests. In SL, this could be done by setting up election districts according to where people’s homes are set, say. Or, for that matter, we could not divide people up at all, but elect all representatives “At Large”. There are all sorts of clever voting schemes that lend themselves to this; cumulative voting, preferential voting, rank voting, instant-runoff voting… (See the Wikipedia article on voting systems for a variety.) Many of these have odd little quirks that have made people reluctant to actually try them out widely for electing actual governments; might be fun to see what happened if they were tried in a virtual world where people actually do care about the outcome, but no one was actually going to be shot or starved or imprisoned. Who would actually get to vote? Well, that’s slightly tricky. Obviously you have to keep people from generating tons of anonymous alts just to vote. Sad to say, there might therefore have to be some sort of tie to RL identity; one vote per Premium account would at least make it expensive to generate lots of little fake voters, and one vote per instance of age-verification would solve things to the extent that that actually works (while at the same time disenfranchising people who can’t or don’t want to age-verify because of national or identity issues or not having a credit card or whatever I forget, which would be bad). One vote per 256m2 of land owned could work, but so blatantly giving power in rough proportion to wealth would probably not be popular. And what would people and/or representatives be voting about? Whatever the Lindens decided to put up for vote! Or decided to allow other people to put up for vote. As many other people have said, SL is a private enterprise, and the owners can do what they like. So if they decide to institute some sort of democracy, they also get to decide which issues are democratically decided. All sorts of possibilities suggest themselves! We could vote on changes to the ToS, on the naming of new continents, on whether to have SL9B on PG or Adult land, on what color to pave Route 12. We could elect members of the G-team! Anyway, could be fun! Chaotic! Full of unintended consequences and delightful surprises!